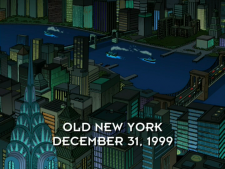 Difference between revisions of "Old New York"
In the Stupid Ages, Old New York was known as simply New York. It was one of the biggest cities in the world and produced more garbage than any other city. In 2000, the city put its garbage on a giant barge, which was launched into space 52 years later (1ACV08). 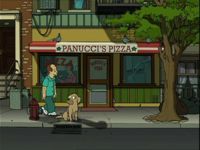 Description: A pizzeria where Fry was the delivery boy. Description: A cryogenics lab where, in the 20th century, Fry gets frozen. In the 30th century, Leela is the Fate Assignment Officer. Description: An attraction on Coney Island. Description: 20th Century Fox televises programs such as Single Female Lawyer and programs of the form World's Blankiest Blank. Trivia: WNYW Fox 5 is the real life flagship station of the Fox Network. Description: The family home belonging to Yancy and Mrs. Fry. The house appears to be unchanged in over a thousand years, remaining in its original decrepit form. An unused bomb shelter, housing the best music of the 1980's in one amazing collection, can be found in the basement. 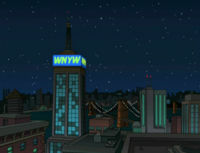 It is located in the Flatbush neighborhood of Brooklyn, as evidenced by the Newkirk Avenue Subway Station where Fry, Leela, and Bender arrive at. 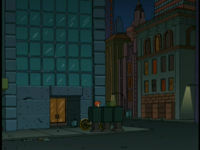 The group use Bender as a form of transport to get there, with Bender dubbing himself 'The B Train'. Ironically, the B train is an actual subway line that serves the actual Newkirk Avenue Station. 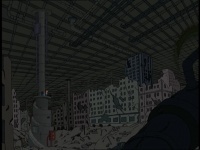 The remains of much of New York still exist as ruins in the 31st century, due to the attack by Bender, below the streets of New New York. They may be part of the New New York sewers. 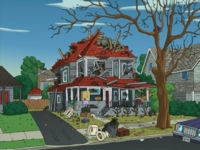 Fry first saw the ruins when he and Bender were escaping from Leela during his first day in the future, and Fry recognized his old neighborhood. 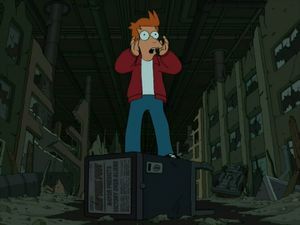 Fry in the ruins of Old New York (3ACV04).